Klaus Schoneich and Gabriele Rachen-Schoneich attribute ninety-five per cent of all problems in the horse’s way of going to its natural, intrinsic crookedness, and to the fact that, in training, little or no importance is attached to straightness. Crookedness has a negative effect on the horse’s health, performance and behaviour, but thanks to a system of straightness training devised by the authors, the horse’s basic way of going can be corrected in a relatively short time. 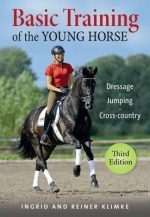 This book describes in detail, and with clear illustrations, the whole process of correcting crookedness, and includes work both on the lunge and under saddle.